Augustus Rock Vom Century, "Auggie" is a two month old Black and Tan German Shepherd. His eyes are stunning and can look right into your soul. He is already being socialized and loves people. His favorite pastime is retrieving his ball and frisbee. 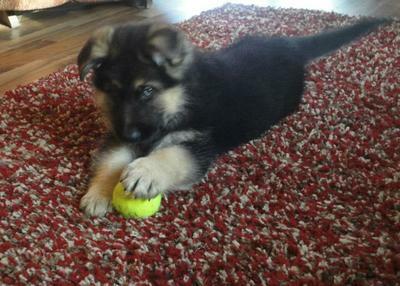 Thanks so much for sharing a little bit about your beautiful German shepherd puppy Auggie with us. I truly appreciate you taking the time. It sounds like he has a very promising career as a therapy dog ahead of him. I wish you both nothing but the best about that. What a blessing his presence will be to all the people he meets in those homes and hospitals. What a wonderful career choice. If you have the opportunity in the future I would love for you to write us again and tell us all about his adventures as a therapy dog and to share some pictures of him actually "on the job". These dogs do great work and the handlers do a great job too in getting them to where they need to be and training them to do the job. So thanks to you as well, Tammy! Continued success to you and your German Shepherd puppy now and in the future too. Your puppy Auggie is just Adorable! That's great he will help people who will appreciate him with open arms. I'm sure a lot of people will fall in love with him. Shepherds are so protective and loyal, no matter if female or male they have the same characteristics. Take care of your Auggie and he will take care of everyone!